Morieux, Renaud. “French Prisoners of War, Conflicts of Honour, and Social Inversions in England, 1744-1783.” The Historical Journal (2013). During the wars of the eighteenth century, French prisoners on parole in Britain were placed in a paradoxical situation of captives with privileges. Instead of studying these men as if they dwelt in a world apart, this article focuses on captivity zones as a social laboratory, where people of different status would socialize. These spaces accordingly provide a lens through which to glimpse the repercussions of international conflicts at the level of local communities. The disputes which opposed these captives to the English population, which were the object of letters of complaints sent by the French prisoners to the authorities, shed light on the normative and moral resources which were used by eighteenth-century Englishmen and Frenchmen to legitimize themselves in situations of social conflict. As a configuration characterized by shifting social relations, the parole zone brought together local, national, and international issues, intertwined primarily in the rhetoric of honour. In these incidents, there was no systematic alignment of class and national discourses and actions, while the precise standing of these Frenchmen on the social ladder was constantly challenged and debated. The resulting quarrels therefore reveal a series of social inversions: dominant groups in France were in many respects dominated in England. Rather than being a mere reflection of pre-existing social hierarchies, such micro-incidents reinvented them. Glickman, Gabriel. “Christian Reunion, the Anglo-French Alliance and the English Catholic Imagination, 1660-72.” English Historical Review 128, no. 531 (2013): 263-291. The Anglo-French Treaty of Dover has acquired notoriety due to its secret ‘Catholic’ clauses: the promised conversion of Charles II and the declared goal of reconciliation between the churches of England and Rome. Hitherto, these terms have been examined either as a cynical diplomatic gambit by Charles II or the start of a push towards catholic absolutism by a Stuart court faction. This article aims alternatively to locate the treaty within the ideological traditions of the English Catholic community, concentrating on the circle of priests and scholars connected to Lord Treasurer Thomas Clifford, whose writings incubated the vision of a grand reunion of Christendom. It argues that the new alliance was envisaged as an opportunity not merely to change the English religious settlement but to promote reform within the catholic world, unravelling Tridentine standards of uniformity to accommodate the practices of national churches. The project was designed to respond to trends in international diplomacy, to engage points of intellectual attraction between England and France, and, above all, to raise awareness of shared principles that could unite Gallican Catholicism with the Church of England. Yet the conception of French religion presented by the architects of the treaty was drawn out of encounters with an irenic minority within the Paris convents and seminaries, unrepresentative of the attitudes of church and state. As the treaty became exposed to public scrutiny, the disjuncture between this image and the reality embodied by Louis XIV brought serious implications for those English Catholics who had invested so heavily in the reputation of the kingdom of France. Abstracts sure are getting long these days. But that’s a good thing. Happy New Year! Or maybe not. As with so many other early modern phenomena, it depends. Read on to find out why. It’s Thanksgiving here in the U.S., which of course means turkey (probably associated with Anatolia because Englishmen confused the American species with the more-familiar guineafowl from Africa imported into Europe by the Ottomans) and football (American football that is, where they don’t actually use the foot much and disdain those players that do). As we’ve discussed before, language is fun. 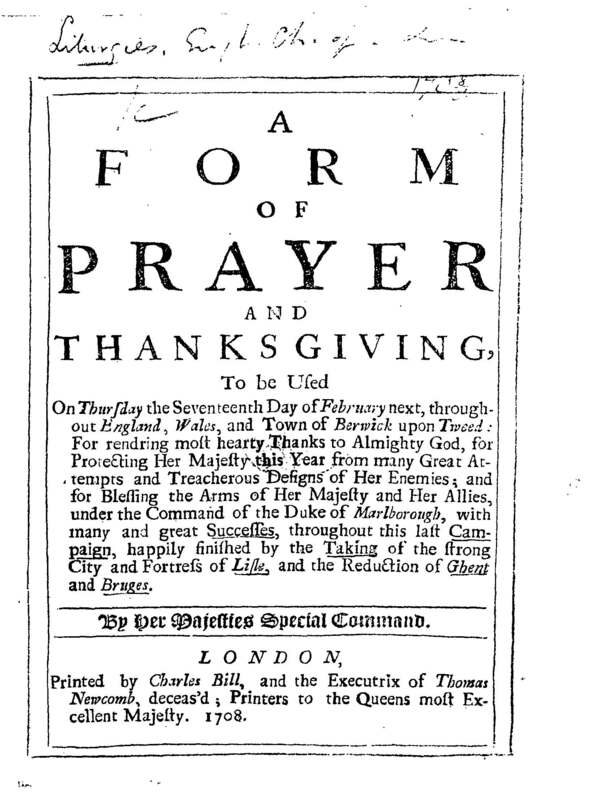 Back in the day, at least in Europe, they didn’t have a single Thanksgiving holiday in late November, but if you do a Google Books search on “thanksgiving” and limit it to the early modern period, you will quickly discover that they did indeed have many many many days of Thanksgiving. Yet these were not the gluttonous food-fests of today, but instead official days of prayer and righteous celebration, declared by the government to celebrate military victory, usually a battle or a successful campaign. Preachers used these opportunities to write, present and publish sermons on the topic, usually equating their country/side with God’s and thanking Him for success, and frequently calling for moral reform and regeneration at the same time. When times were tough, the preachers excoriated their sinful congregants for making God punish them with military defeat. If your war went well, you might have a day of thanksgiving every year; the Dutch averaged two per year between 1688 and 1713. Or maybe you pretended to celebrate a victory in order to buoy domestic morale – the English mocked the French for declaring Te Deums to cover up their defeats. For much of the 20C, historians had argued that the Thirty Years War was the last of Europe’s ‘wars of religion.’ But over the past few decades numerous scholars studying the post-Westphalian period have pointed to practices like public days of thanksgiving in order to remind us of the ways in which religion continued to be intimately connected to war. Haks, Donald. “Propaganda from the Pulpit?” In J.A.F. de Jongste, ed., Anthonie Heinsius and the Dutch Republic 1688-1720. Politics, Finance and War. The Hague, 2002. Haks, Donald. “The States General on religion and war. Manifestoes, policy documents and prayer days in the Dutch Republic, 1672-1713.” In D. Onnekink, ed., War and Religion after Westphalia, 1648-1713. Burlington, VT, 2009.